I was hanging around the front of the Apple Media Event yesterday, taking some outdoor shots of the Yerba Buena Theater and all the goings on around it. 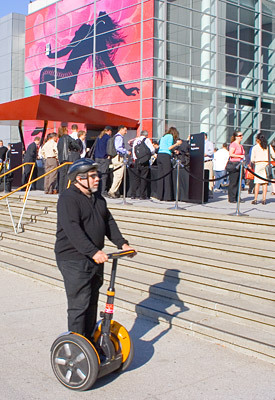 Out of the corner of my eye I see Steve Wozniak, Apple Computer co-founder, approach on his Segway. I was able to quickly recompose the shot to capture Steve in the foreground zipping by with the all the Apple decor in the background. I was shooting with a Canon Digital Rebel XT, ISO 100, 1/250 at f-9.5. Fortunately I was in Raw mode, which helped me tame the intense contrast of the scene later in Adobe Camera Raw. As we've discussed before in our virtual camera club... always take your camera. I was looking at your photos ... very nice. I'm curious about the file jobs_1989, is that the upcoming iTV thingy?